A number of AccessHE member HEIs and other partners from the AccessHE Disability forum worked collaboratively to deliver a brand new event – a University Information Day for Disabled and Dyslexic Learners – on Friday 3 November 2017. 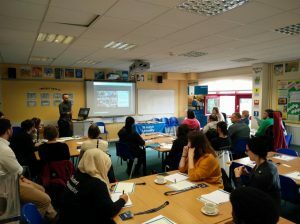 Kindly hosted by St Mary’s University, Twickenham, we welcomed nearly 20 students, teachers, SENCOs and parents for a day packed with advice from the experts and insights from current students. We were also joined by staff and students from our members St Mary’s University, Brunel University London, London Metropolitan University, University of East London and the University of West London. Michael Cobden from St Mary’s discussing his top tips for disabled students transitioning to HE study. After an introduction from Conal Baxter, President of St Mary’s University Students’ Union, attendees were able to hear from Michael Cobden from the St Mary’s Student Wellbeing Service about his top tips for disabled learners transitioning to university. Afterwards, Nathan and Ed from A2B Assessments kindly quelled some fears about the assessment of needs and led us into lunch at the St Mary’s Refectory. After lunch, six current students from three London institutions and who identified as having a disability offered some of their own personal experiences about life and study at university. We were extremely thankful to the students who joined us for being happy to reflect honestly on their time before and now whilst at university, and it was particularly great to hear about some of the student-led initiatives such as St Mary’s No Ordinary Society and Ryan’s Enabled Not Disabled movement. Finally, Adam Hyland from Diversity and Ability (DnA) gave an informative talk and demonstration on the range of assistive technologies and productivity tools which students can use to help with their learning. Some of the St Mary’s ambassadors then kindly led a quick tour around the campus for those able to stay behind. Feedback from the day has been extremely positive. We’re thankful to all of those who helped make this event possible, and particularly to those who joined us on the day from nine different schools and colleges. If you’d like any further information, please don’t hesitate to contact Tanyel Kazim, AccessHE London Programmes Coordinator, at tanyel.kazim@londonhigher.ac.uk.